Leading Champion Hurdle hope My Tent Or Yours made an impressive return to action with a stylish victory in the StanJames.com Fighting Fifth Hurdle at Newcastle. 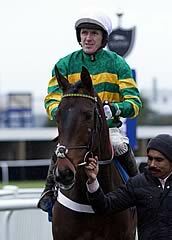 Given a patient ride by Tony McCoy, the Nicky Henderson-trained six-year-old jumped into the lead at the second-last and quickly stamped his authority on proceedings. The 8-11 favourite galloped on strongly to win this Grade One for owner JP McManus by three lengths from Cockney Sparrow, with Grumeti another two and a half lengths away in third. Galvanised by wearing blinkers for the first time, Cotton Mill ensured a truly run race by making the running, and he held that position until three flights from the finish, where Grumeti went on. However, that move was covered by McCoy on My Tent Or Yours, who defied a near eight-month absence to cruise to the front. Cockney Sparrow stuck on well to claim second spot but was no match for the classy winner, who was roundly cut in the betting for the Champion Hurdle at the Cheltenham Festival. The well-regarded Melodic Rendezvous failed to strike a blow and could only stay on at one pace. McCoy said: "He's won easy, but you would have wanted him to, really. It was a good start for him. He settled nicely, but we didn't go too quick early. I felt us and Grumeti really quickened it up from three out and were really racing. It was a good performance, a good starting point, and I'm not surprised he did it like that. "But for the life of me I can't understand bookmakers cutting him for the Champion Hurdle - he was by far the best horse on paper going in. He's got to keep on improving. Hurricane Fly has won 17 Grade Ones and he is the one we all still have to beat, for me." Speaking from Newbury, Henderson added: "He looked good from what I saw of it, and all being well he'll go off to the Christmas Hurdle at Kempton now." Trainer John Quinn said of runner-up Cockney Sparrow: "She'll go for a Listed mares' race at Doncaster on January 25 and then she'll go to Cheltenham for the David Nicholson. If she stays she'll have a right chance. "What I liked was that she stayed on again when it looked like she'd only be third. She's been placed in a Grade One now so it's job done, that's what we wanted. The winner will take a lot of beating in the Champion Hurdle, so it was a massive run. You've got to take a punt, if it doesn't work you can always take a step back."